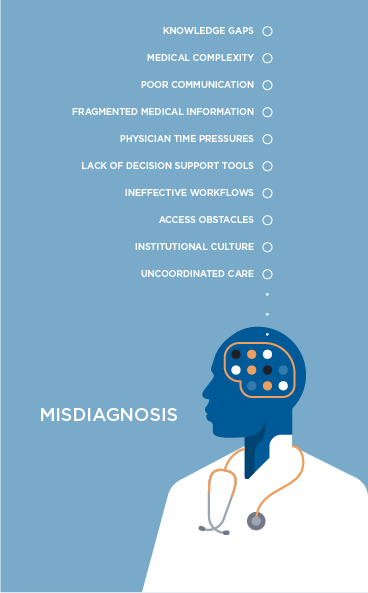 Continue reading in the Best Doctors’ white paper , Combating the Human and Financial Impact of Diagnostic Error , to learn how Best Doctors is solving the causes of misdiagnosis with our expert second opinion service and our analytics capabilities. The causes of misdiagnoses are numerous and complex, involving both human error and systems issues. Near the top of the list is the U.S. health care system’s decentralized nature. It is not uncommon for a patient to have multiple medical professionals in different settings delivering uncoordinated care and communicating inadequately. Additionally, a case is likely to have many medical records scattered across multiple sites. One survey estimated the average patient’s health is dependent on 200 or more pieces of paper in 19 different locations, and each single patient visit generates 13 pieces of paper. For complex cases, the thousands of related documents could be in even more different locations. This lack of coordination can’t help but result in fragmented medical information, with no single practitioner having a full clinical picture. Therefore, it is easier for things to go wrong. For example, the heart patient cited earlier is even more susceptible to error if the clinicians involved in his case aren’t sharing all of the information or coordinating care. Time compression also contributes to misdiagnosis. In general, doctors are only able to spend 13 to 16 minutes with each patient. Yet, the Annals of Family Medicine found the average primary care physician would need to spend almost 22 hours a day to provide all of the recommended acute, chronic and preventative care for a panel of 2,500 patients (the average U.S. panel is 2,300). These pressures leave little time for synthesizing patient information. The increasing complexity of medical care doesn’t help either. In the last few decades, we have witnessed a profusion of medical and clinical advancements, from genomics to biologics. Digesting and optimizing this data explosion is no easy task. Patients in urban areas with academic medical centers or tertiary care hospitals may be able to access the latest advances in medicine, but others are often limited by geographic, cultural, behavioral or financial obstacles. While improvements in several diagnostic-related areas are already in place or underway, many of the suggested changes are costly and require a great amount of time. Therefore, they are most likely to occur and evolve over the long term. Yet, misdiagnosis is an urgent issue that requires immediate action. Solutions that do not require a total transformation of delivery systems must be implemented. 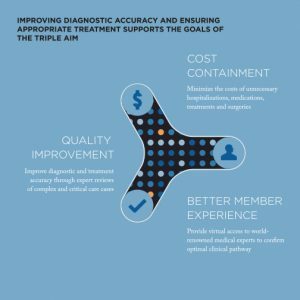 As diagnostic accuracy gains more attention, a growing number of strategies and systems are being implemented to address the problem. In addition to electronic medical records, these measures include data analysis, point-of-care technologies, health plan redesign, independent second opinions and other advances. Second opinions, in particular, have been cited as a Top 10 solution for reducing diagnostic error by the National Patient Safety Foundation, the Cautious Patient Foundation and the Society to Improve Diagnosis in Medicine. Organizations that make second opinions readily available – most notably in cases involving surgery, critical care and chronic conditions – position themselves to more rapidly achieve goals such as the quality, cost and member experience goals of the Triple Aim. As a complement to traditional second opinions, some employers and health plans offer remote second opinions, which do not require travel or in-person doctor visits. These services can avert harmful testing and treatment, decrease absenteeism, promote employee/member retention and ultimately save lives.